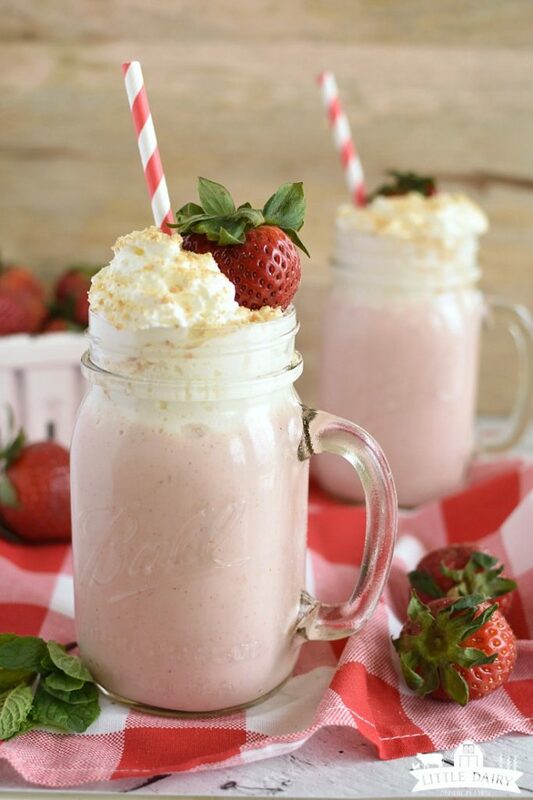 Easy Strawberry Cheesecake Smoothies will surely remind you of a luscious slice of strawberry cheesecake in a thick, decadent smoothie! Serve it for breakfast, a snack, or dessert. It’s a little slice of summer all bottled up in a jar! The other day, I wandered past a case of fresh strawberries in the grocery store and had to take a little timeout to just stand there and soak up that delicious smell! By time I got to my car, I had way more strawberries than any family can possibly consume! How does that always happen to me? You know what, though? I’m thrilled because they are sweet and juicy and I’m enjoying them at every meal. 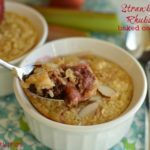 As usual, I had fantastic intentions of whipping up a few fancy pancy strawberry desserts like Strawberry Banana Shortcake, Creamy Strawberry Limeade, and Fruit Pizza with Oatmeal Crust, and then life happened! So I decided I’d make a smoothie instead because smoothies are so quick and easy to make and my boys go crazy for them! 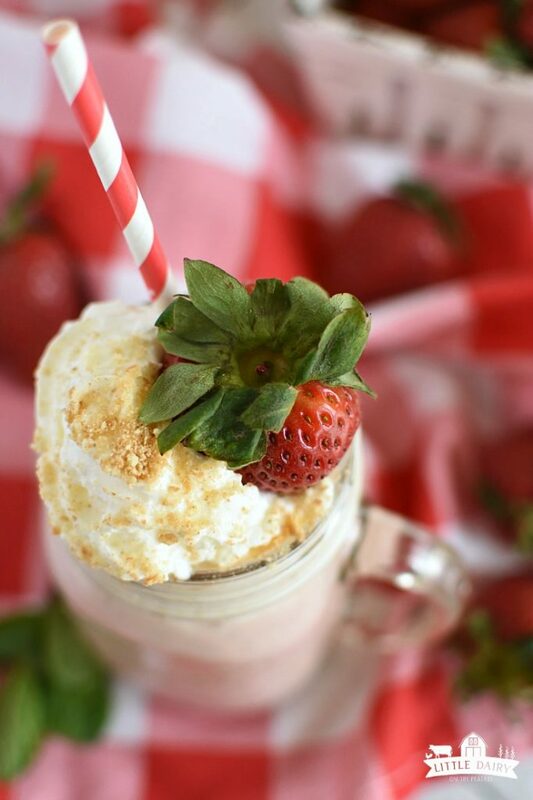 This Strawberry Cheesecake Smoothie has that tangy taste of cheesecake combined with fresh strawberries and has graham crackers mixed right in! That’s right…no need to make a crust for this cheesecake dessert! Yay for that! Of course Strawberry Cheesecake Smoothies are fantastic for breakfast, but they also make an easy on the go snack that’s full of essential nutrients. 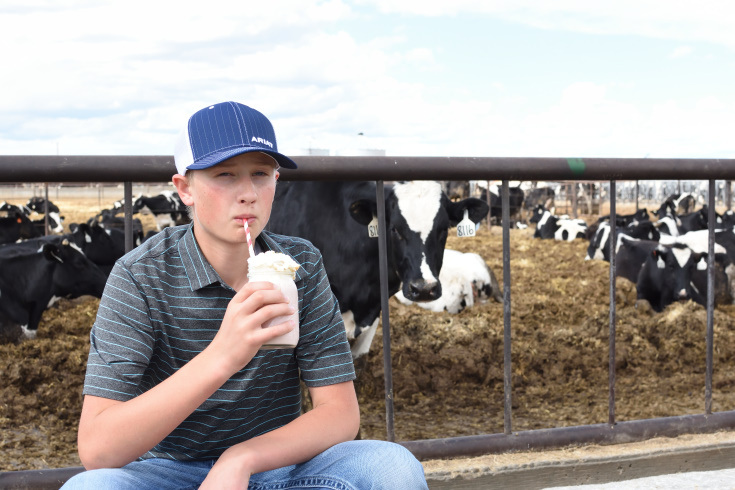 Smoothies are my favorite snack to bring out to my boys while they are working on the farm! What to do with leftover smoothies? You can pour leftover smoothies into a popsicle mold and freeze them. Pop them out later and you have an instant nutritious dessert! I even let my kids eat them for breakfast and they think I’m super cool! Another thing I love about this smoothie is that it’s packed with dairy products! You know I love dairy products! Just think of all the yummy ways you enjoy them; milk in your cereal, cheese on your pizza, ice cold chocolate milk, ice cream, and yogurt-packed smoothies! Besides not being able to imagine life without milk, cheese, yogurt, ice cream, and whipped cream, I happen to know how much effort goes into producing nutritious dairy products for the world to enjoy! A little about dairy farms! Did you know that 97% of dairy farms are family owned and operated just like our farm!? Dairy farmers are completely dedicated to their cows and the products they produce. Dairy farmers take their responsibility to provide a safe, nutritious product very seriously. We milk about 1,200 cows on our family farm. We also raise our own hay, grain, and corn to feed to our cows. Dairy farmers are devoted to caring for their cows and land because that means a fresher, better product for you. We are constantly trying to become more efficient, recycle, and save water. One of the things we do is compost all of our manure. It’s hauled from the cows’ pens and stored in an area until it’s ready to be composted. The manure is turned and stirred several times throughout the summer until it’s dried into rich compost. During the winter months, the compost is applied to our fields where crops will be grown the following year. It’s awesome knowing we are recycling the leftover nutrients in cow manure and using it again! This is just one way dairy farmers are committed to being more efficient. It’s 8:00 p.m. as I’m writing this post. 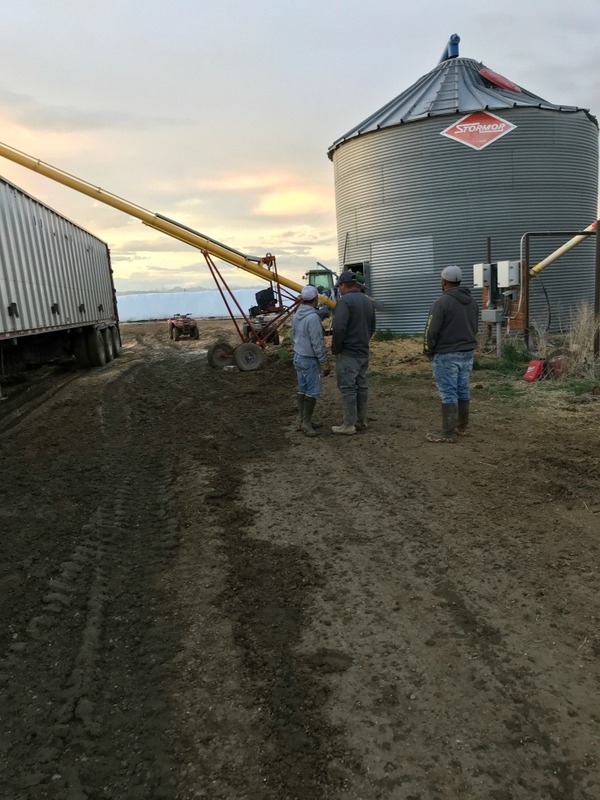 My husband and three boys are still out working on the farm because the grain auger broke and they have a semi load of corn to unload. I’m not sure when they will finish up their work for the day. I do know for sure they won’t be in for dinner, to do homework, or practice the piano until the cows have been taken care of! That’s the way we roll around here! When you are a dairy farmer, the cows come first! So whip up a smoothie and know you are not only enjoying an incredibly tasty treat, you are also getting nutrient-rich dairy products that truly were produced with care! 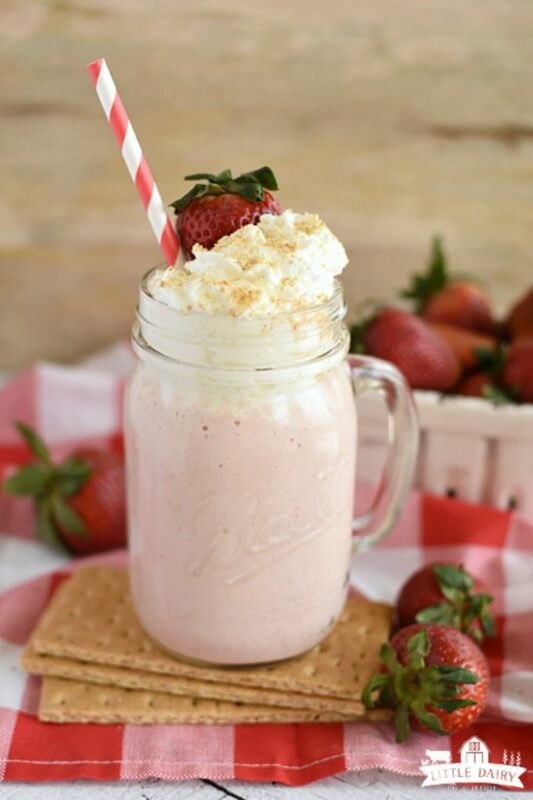 Strawberry Cheesecake Smoothies are one of those quick and easy treats I’m sure will be enjoyed all summer long at our house! They need to happen at your house, too! Crush one graham cracker into crumbs. I do this by putting it in a sealable bag and rolling it with a rolling pin. Set aside. 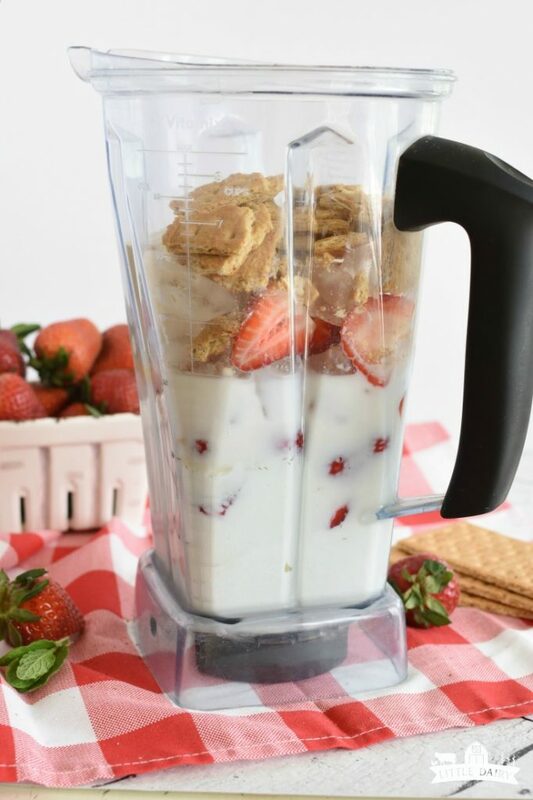 Add milk, yogurt, strawberries, dry pudding mix, ice cubes and two graham crackers to a blender. Blend on high until smooth. If you want your smoothie to be thicker add more ice. If you would like a thinner consistency, add a little milk. 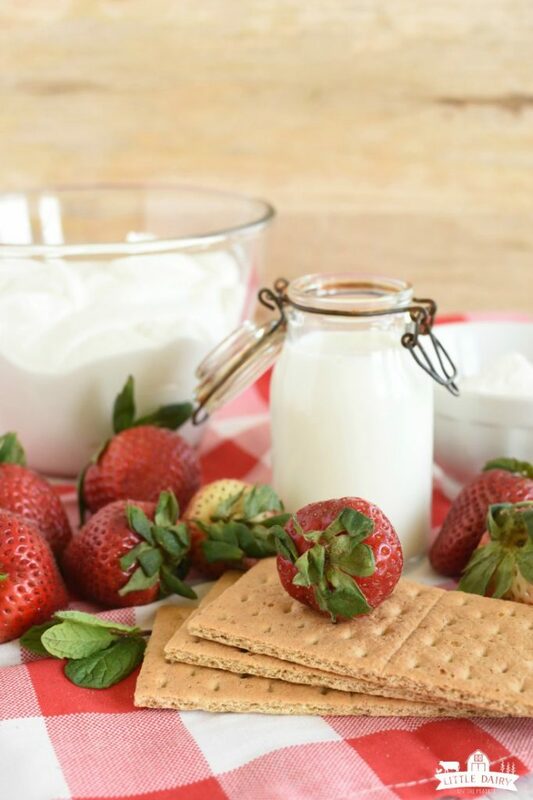 Pour in glasses and garnish with whipping cream, reserved graham cracker, and strawberries. 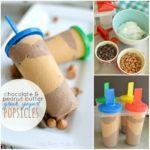 Serve immediately or pour into popsicle molds and freeze. This looks so delicious!!! Can’t wait to try! It’s a perfect afternoon snack! I think I have fallen in love with this smoothie! I wish I was sipping on this smoothie right now! So tasty looking! 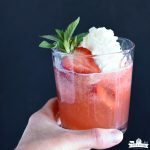 Anytime is a great time to be sipping on this smoothie! Oh my goodness, this looks amaazing!! The perfect summer treat!! These are the perfect dessert-like snack! Easy, healthy and taste! Exactly what I need! 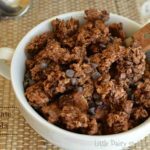 It hits the spot for breakfast, snacks, or dessert! Strawberry cheesecake in a smoothie is like a dream come true. I am making it. It’ is totally what dreams are made of! This looks like my new favorite smoothie! It’s much faster than making cheesecake and you still get all that yummy flavor!